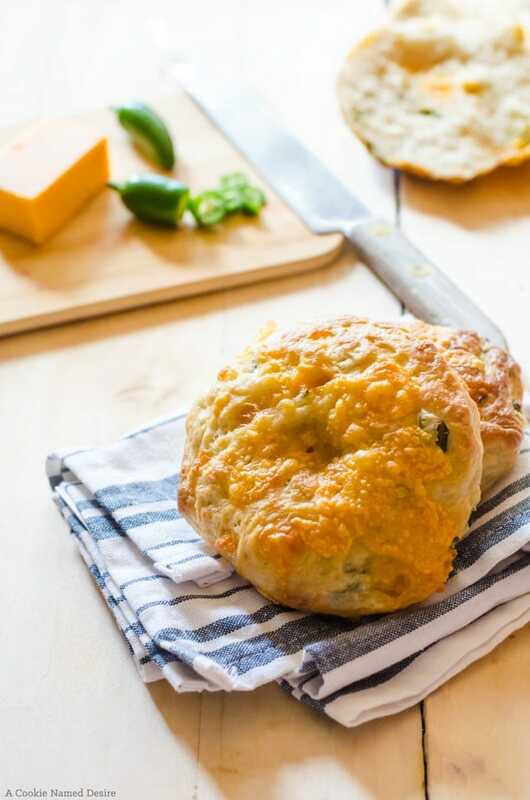 A world of cheesy, spicy, carb-loaded bliss awaits you with this mouthwatering jalapeno cheddar bagels recipe. Pro tip: Make a double batch. You’ll need it! Okay, so after my decision to enter the dating world again, I realized one critical thing: I don’t go out anywhere that I could actually meet someone to date. My life is literally spent at home working, or out with Nadia. And there aren’t any single guys out at the places Nadia and I go. Sure, some of the guys may be single dads, but I have bad eyes and trying to figure out if I see a ring or not could result in one or two awkward situations. So…… I created an online dating profile. We live in a digital age and so many romances begin online now, so I figure it is worth trying out. Figuring out what to say is so hard. 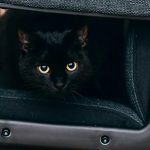 How do you talk about yourself with confidence without sounding narcissistic; what is the right balance of funny without seeming as though you are trying too hard? How does one describe what you are looking for without sounding like your standards are too high…or too little? Don’t even get me started on pictures. At that point I was so stressed out about the process that I just posted whatever I already had available that didn’t embarrass me too much. When you start an online dating profile, is it normal to suddenly want to lose about 15lbs so you look better in person than what you do in those photos? Nothing is quite as terrifying than the thought of meeting some guy who sees what you look like in person and decides to run away in the other direction. Guys, I am having some major anxiety here. Comfort food is definitely in order here. And nothing is more comforting to me than carbs, so I decided to make these jalapeno cheddar bagels. I figure the jalapenos will give me the kick in the pants I need to woman up and not stress out about this whole profile thing too much. I used jalapenos from my garden for these jalapeno cheddar bagels. This isn’t my first year growing jalapenos, but it is the first year that I grew enough to really enjoy. I am so surprised at how potent homegrown jalapenos are. Seriously, I just plucked a jalapeno from the plant and accidentally brushed my fingers against my face and my skin started burning for hours. I sliced and grilled one for burgers one night and still the heat was enough to bring tears. In case you are wondering, I do have a pretty good tolerance for spicy food, but this was just so intense. Fortunately, they don’t seem to be so intense once baked in a bagel with a ton of cheese. At least I didn’t think so. These jalapeno cheddar bagels are perfect on their own or used for sandwich bread (May I suggest a beer braised chicken sandwich). 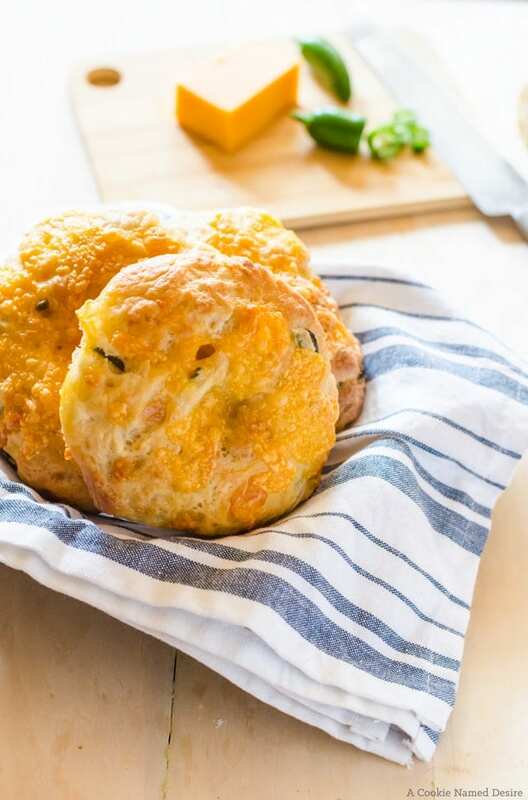 When you begin working with the dough after adding the cheddar and jalapeno, it may seem as though there is too much cheese for the dough to handle. Wipe that thought from your mind and work through it. Once you let the dough rise, it will cover some of the cheddar and jalapenos and you might lose a tiny bit of the cheese when boiling (I found the jalapenos stayed in just fine), it won’t be enough for you to get upset over. I chose to add the additional cheese 5 minutes before the bagels were done baking. I regret that decision because I prefer when my cheese gets a little brown and toasty. 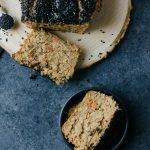 At five minutes, it melts and gets a little bubbly, but almost no browning. Next time, I will add it sooner. 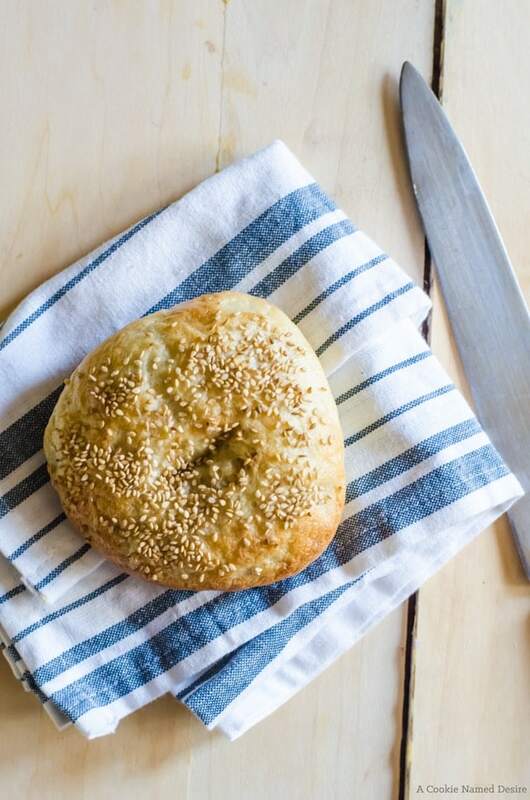 I also made one into a sesame seed bagel for N. I just took out a portion of the dough before adding the filling, and topped with sesame seeds just after boiling. The most beautiful marriage of jalapenos, sharp cheddar cheese, and chewy New York style bagels. 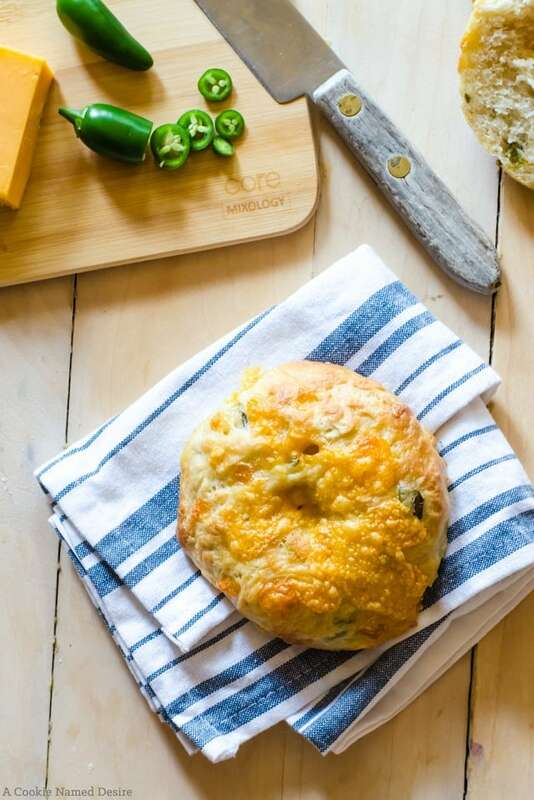 You won't want any other bagel after you've tried this jalapeno cheddar bagel! Make the dough for the New York bagels allow to rise for the one hour as instructed. Deflate the dough and work in the jalapenos and cheddar until it is evenly spread throughout the dough. It may seem as though there is too much, but trust me on this. Boil a large pot of water, then turn down the heat so the water is at a bare simmer. Divide the dough into 7 balls. Try to work the balls so that most of the filling is inside the dough, but is it okay if some sticks out. Use a lightly floured finger to push a hole through the middle of the balls and gently spread out the hole until it is about an inch in diameter. Place on a lightly greased baking sheet. Allow to rise for about 30 minutes. Preheat the oven to 425 degrees F.
Boil the bagels for about 1 minute on each side. Sprinkle the baking sheet with cornmeal and place bagels on top. Bake for about 10 – 13 minutes, and then top with cheese. Bake for another 6 – 8 minutes. Allow to cool for about 15 minutes before transferring to a wire rack to cool completely. Amanda, these bagels look bomb! And good luck with the online dating world; even though writing profiles seem nerve-wracking, it definitely works! Most of my friends have met their SOs through OKcupid, Coffee Meets Bagel, and sometimes even on Tinder. Thanks! I’m not ashamed to admit I ate all the bagels. What, Tinder isn’t just for hookups? I’ll have to take a look. I’ve heard a lot of success stories, so I am hoping all the nerves are just in my head and I can enjoy the experience! These bagels look awesome!! I made some jalapeno cheddar crackers a couple of weeks ago and have decided that jalapenos and cheddar are one of the best combos. So, that said, I totally need these bagels in my life…like yesterday. Look at that melty cheese…mmm! P.S. if a guy runs away when he sees you, HIS loss and he’s probably too insecure to form deep relationships anyways. 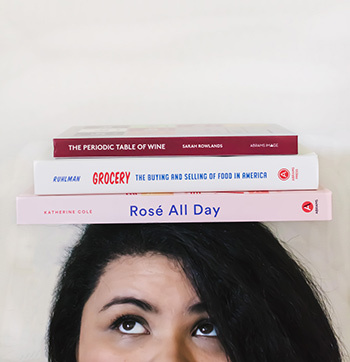 You go rock that dating world, girl! Jalapeño and cheddar are soul mates, I think! You are right, guys who run aren’t worth the time and is better for me in the end! Yup, that pretty much sounds EXACTLY like online dating to me! But I met my husband online…so there is hope!! 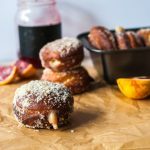 There would be no stopping me if I were around these cheesy spicy bagels…I’m pretty sure I would eat the whole batch in one sitting! Wow, these look amazing!!! I seriously need to learn how to make bagels. ASAP. Amanda these look positively divine!! I’ve been wanting to make bagels at home for a while now and I’m pretty sure my husband would go crazy over these 🙂 Oh, I met my husband online too and we’ve been together for over 10 years 🙂 Good luck!